Any serious cook should try to keep an herb garden. Even if you live in a small apartment, you can keep a small one in a pot on the counter. The types of herbs will depend on what kind of cooking you’re interested in – if you like Thai food, for example, you’d want to grow fresh cilantro, whereas a cook who prefers Italian might grow a lot of basil. 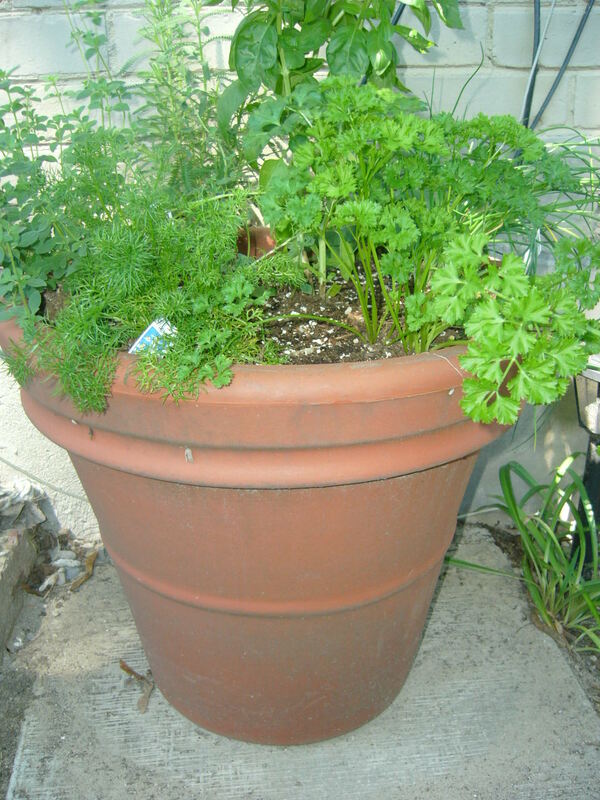 The fresh herbs I typically have on hand include: sage, Italian parsley, thyme, rosemary, basil and oregano. I love being able to snip off a bit of herb as I need it. It’s the ultimate fresh, local ingredient. Here is a recipe I developed that is quick to put together. The dip’s flavour will get stronger over time so if you make it in advance, taste it and adjust seasonings before serving. Place rinsed and drained beans in a large mixing bowl. 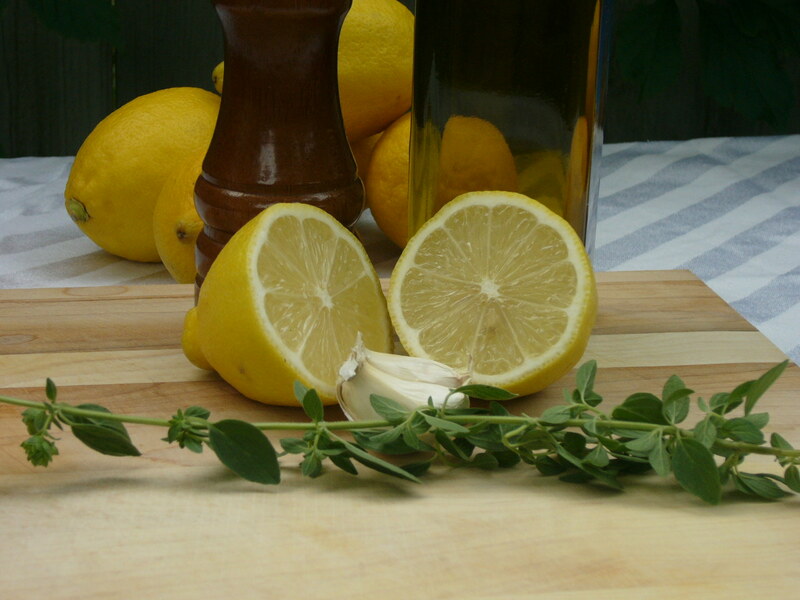 Add olive oil and lemon juice. Using a potato masher, mash beans until they are completely mashed and relatively smooth. 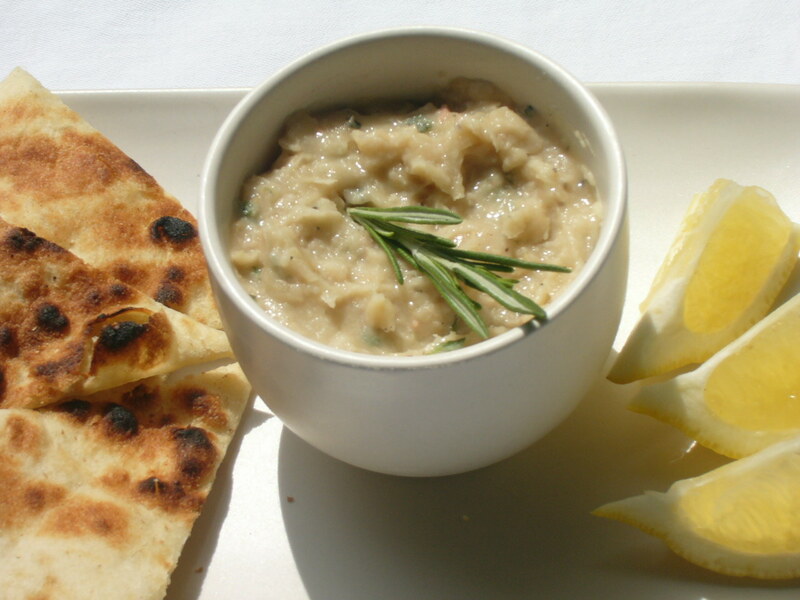 Do not use a food processor as it results in a dip that is grainy and lacks creaminess. Mix in chopped herbs, garlic and add salt to taste. Dip can be made in advance and refrigerated until ready to use. 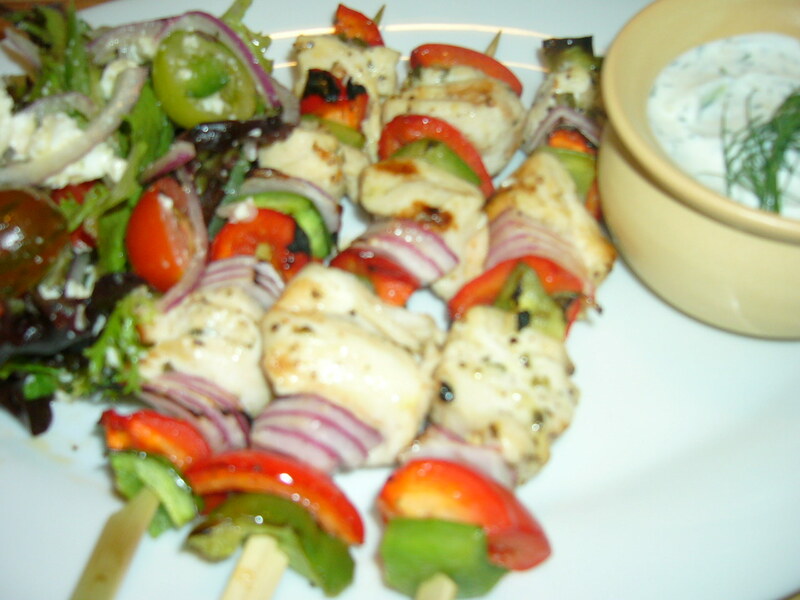 Serve with flatbread or grilled pita wedges. It’s mid-summer and the farmer’s markets are full of great fresh produce. Luckily, when fruits and vegetables are at their peak, you don’t have to do a lot with them to make them taste good. Here are some simple ideas for fuss-free summer cooking. 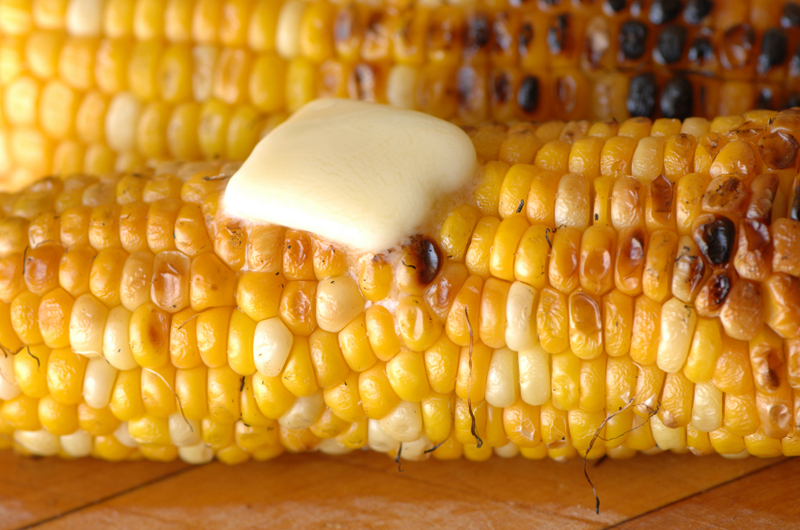 -Shuck some corn and brush with olive oil. Sprinkle some salt and pepper on and roast in the oven or grill on the BBQ until golden brown, approximately 15 minutes (turn part way through cooking). Serve with fresh butter. Put all ingredients in a bowl and whisk until combined. Use on your favourite salads. -Cook new potatoes in boiling water until tender. Toss with pesto sauce and serve with grilled meats. 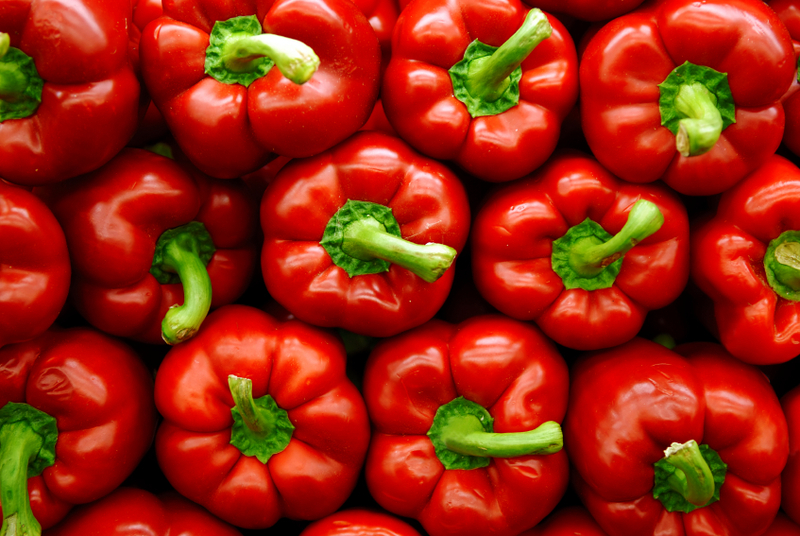 -Make roasted peppers: Cut a bunch of red, yellow or orange peppers in half lengthwise and remove stem and seeds. Roast on a grill or in the oven until skin is black and charred. Place in a large bowl and cover bowl with a plate and let them rest for 15 minutes. Once peppers have cooled, peel off the charred skins and discard. Serve peppers as a side dish, in salads or in dips. -Cut the top 1/4 off of cocktail tomatoes or large cherry tomatoes. Remove seeds. Place a basil leaf and cube of buffalo mozzarella in each one. Sprinkle with sea salt and pepper and drizzle tomaotes with good olive oil. 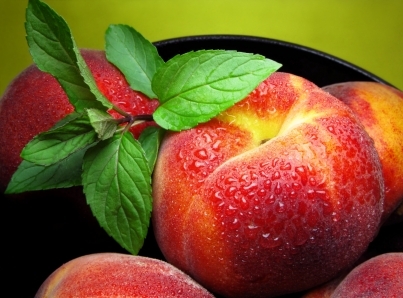 -Toss cut up peaches with a splash of amaretto liqueur and top with lightly sweetened whipped cream or vanilla ice cream. 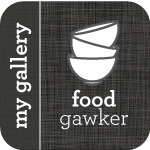 One of the goals of The Seasonal Gourmet is to develop recipes that almost anyone can make without searching high and low for exotic ingredients. 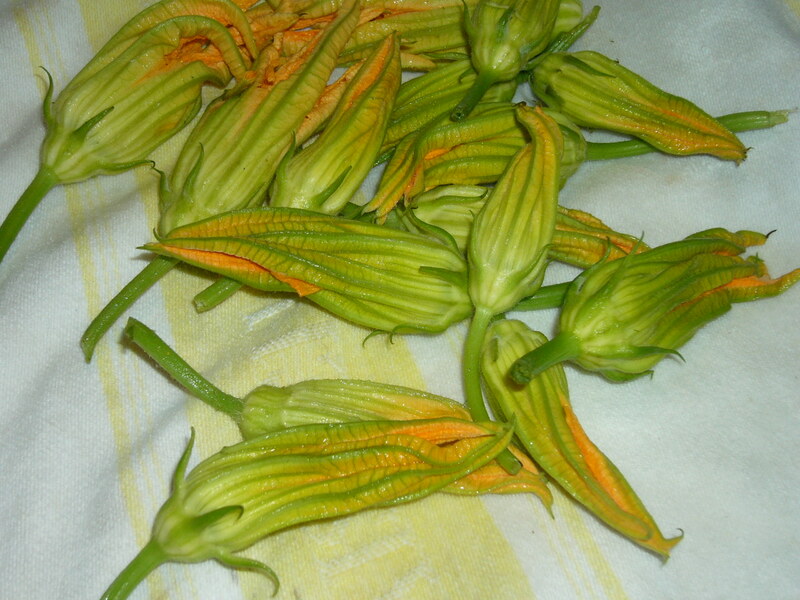 However, I feel that I must make a minor exception for zucchini blossoms. They are not easy to find but if you do happen to come across some they are a wonderful treat. Your best chance of finding them is at a farmer’s market – they are too fragile to be shipped very far for supermarkets. The are very popular in Italy where they are often stuffed and then fried in a batter. I don’t know why they aren’t more popular in North America because there certainly isn’t a shortage of zucchini here. Perhaps a lot of people don’t realize that the flowers are edible (and delicious!). 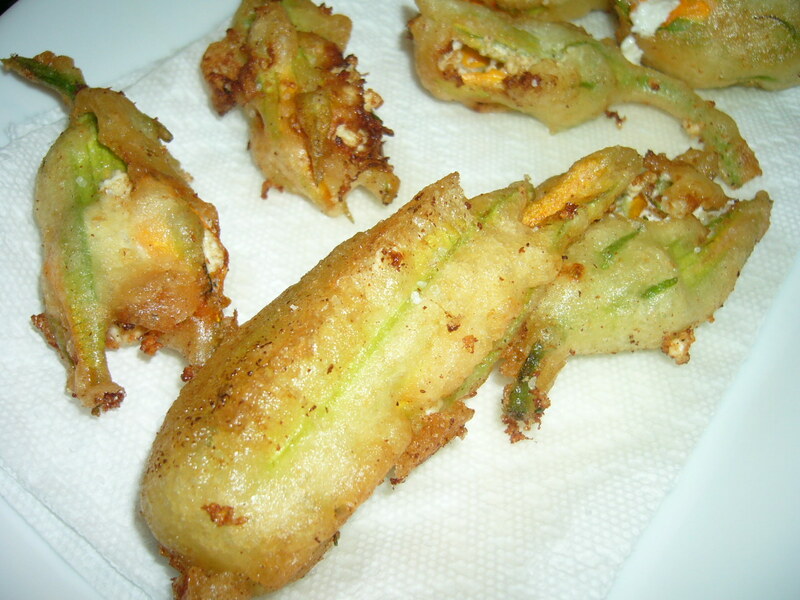 Here are two recipes I’ve developed based on zucchini flowers I’ve eaten in Italy. There are a few steps but it comes together quite easily and the results are definitely worth it. In a medium sized bowl, combine all ingredients and stir until blended. Set aside until ready to use (can be made in advance and refrigerated). In a large mixing bowl, add flour and olive oil. Mix together with a spoon. Add water 1/4 cup at a time, stirring completely into flour mixture. Add enough to make a smooth batter. In a separate bowl, beat egg whites until they form stiff peaks. Carefully fold beaten egg whites into batter. Set aside until ready to use. Clean blossoms thoroughly, by gently peeling back the petals and rinsing inside. Remove any stamen inside the blossom. Blot carefully to dry on clean dish cloths or paper towels. Carefully separate the petals and fill each flower with a spoonful of ricotta mixture. Fold petals back up to enclose filling. Dip blossoms in batter until they are coated. Very carefully heat oil in pan (or heat deep fryer) until it is around 350 degrees Farenheit. You should be able to fry a cube of bread until golden brown in about 15 seconds once it’s at the proper temperature (watch closely and reduce heat if oil begins to smoke). Drop a few battered blossoms at a time into the oil. 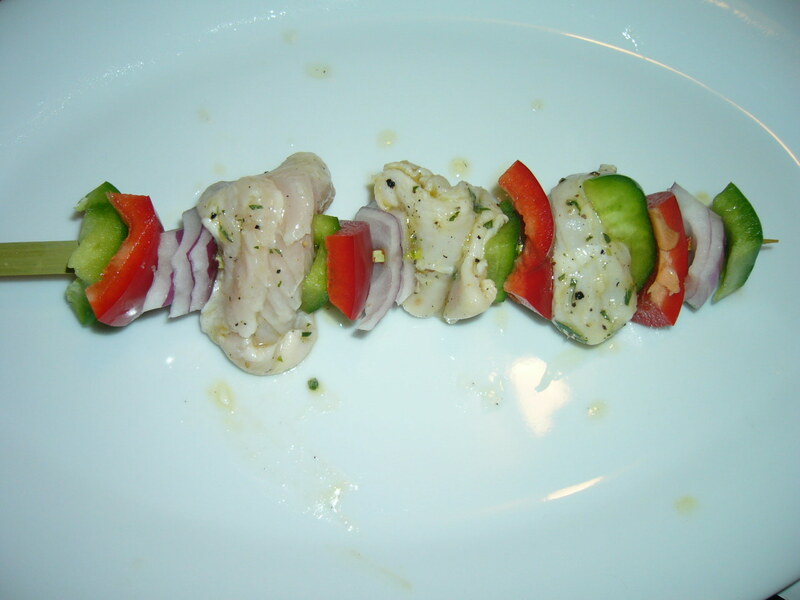 Cook until puffed and golden brown, approximately 2 minutes. Using a slotted spoon, remove blossoms from heat and drain on a layer of paper towel. Repeat the frying process with remaining blossoms. Sprinkle with sea salt and a squeeze of fresh lemon juice and serve immediately. This recipe was inspired by a dish I had at Ristorante Romano, a seafood restaurant in Viareggio, Italy on the Tuscan coast. This follows the same technique as the ricotta stuffed blossoms above but is even simpler because the filling doesn’t require any mixing. Carefully separate the petals and fill each flower with a shrimp. 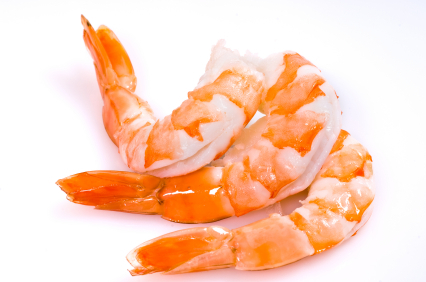 Fold petals back up to enclose shrimp. Dip blossoms in batter until they are coated. 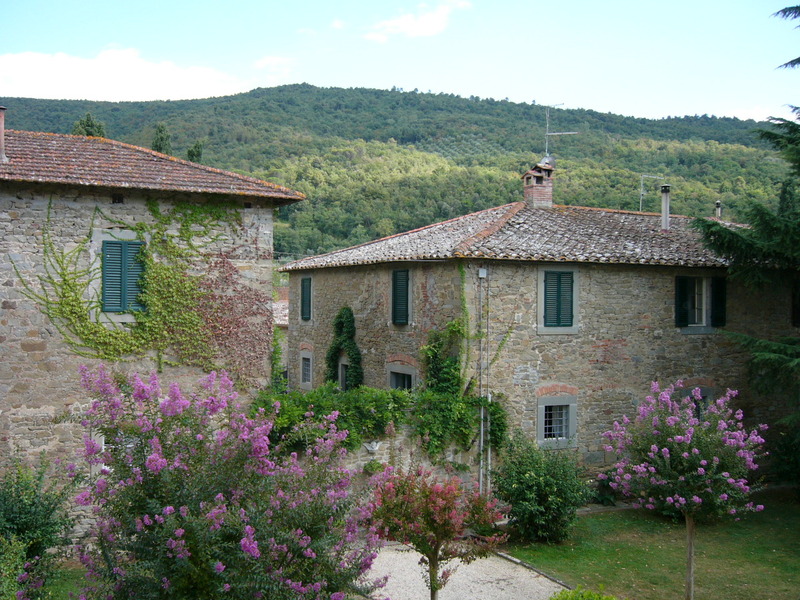 Last summer my husband Allan and I stayed at a beautifully restored villa near Cortona, Italy in the Tuscan countryside. It was called Villa di Piazzano and the buildings and surrounding views were exactly how I envisioned Tuscany after reading Frances Mayes’s memoir ‘Under the Tuscan Sun’. We stayed in the Luna Piena room (‘Full Moon’) and one night we slept with the window open so we could feel the cool evening breeze and enjoy the silence of the countryside (we live in the city so it was a welcome break!). In the morning, the smell of baking from the kitchen below us woke me up. When we went down to breakfast, there was a table full of local sheep’s cheeses, Tuscan fennel salami, juices and fantastic baked goods such as sweet breads and pastries. 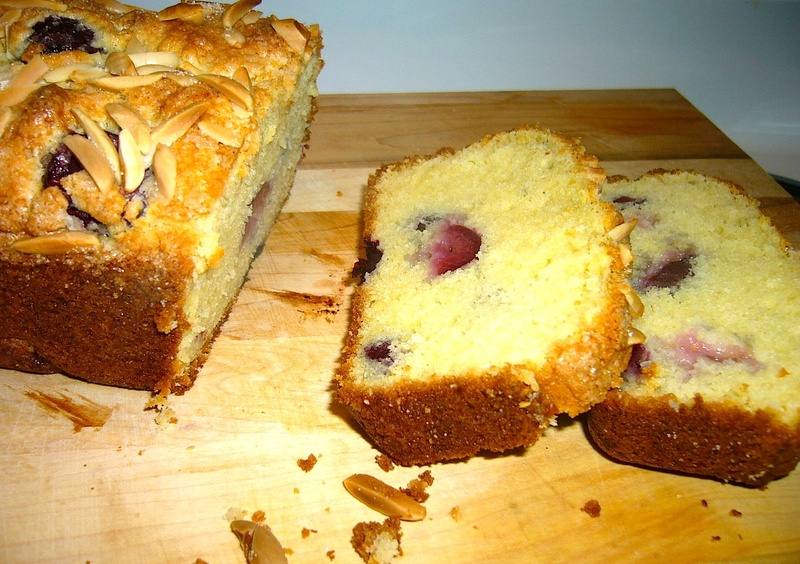 I developed this Cherry Almond Bread so we could enjoy a similar type of breakfast on occasion. 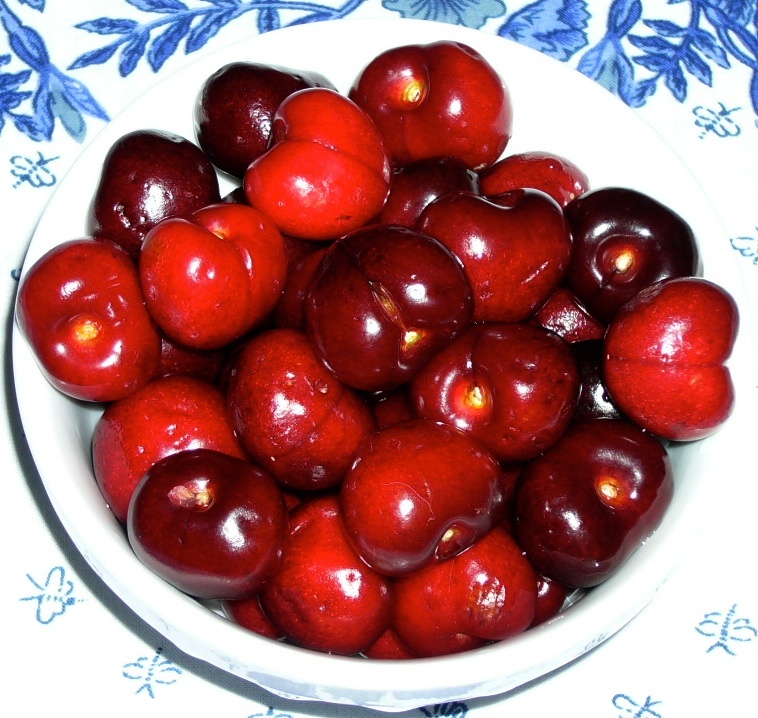 The recipe calls for sweet cherries instead of sour ones – the sweet ones are usually a very dark reddish-burgundy. A note about pitting cherries: There are various methods you can use to pit cherries including buying a cherry/olive pitter. Some people swear by using a chopstick to poke the pit through the cherry while others use the tip of a knife to dislodge it. Because this recipe does not call for a lot of cherries, I simply cut around the middle of the cherry from top to bottom (cutting through the diametre until you hit the pit) and gently pull apart the two halves, using the tip of the knife to remove the pit. This will minimize the mess and give you two nice halves. Preheat oven to 375 degrees Farenheit. Grease a standard size loaf pan and set aside. 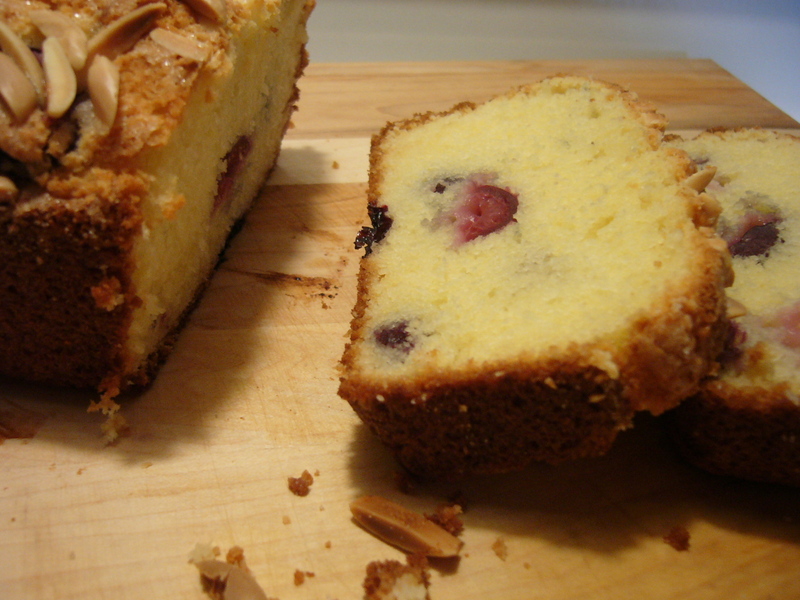 In a small bowl, combine the cherry halves and 2 Tablespoons of flour. Toss to coat the cherries and set aside. In a large mixing bowl, combine 1-1/2 cups flour, the salt, sugar, baking powder and baking soda. Stir to combine. Add the eggs, oil, sour cream, vanilla and almond extracts to dry ingredients. Stir until just combined (the mixture will be quite thick). Gently fold cherries into batter, stirring carefully to mix. Spoon into greased loaf pan. Top with slivered almonds and sugar. Bake for approximately 35 to 40 minutes, or until a knife inserted in the middle comes out clean. Let cool, remove from pan and cut into slices. It’s been a pretty busy summer for The Seasonal Gourmet and unfortunately my computer has been causing technical difficulties which left me out of commission for a couple of weeks. However, I’m testing new recipes with the great produce that’s now in season and just returned from two fantastic weeks in Spain. 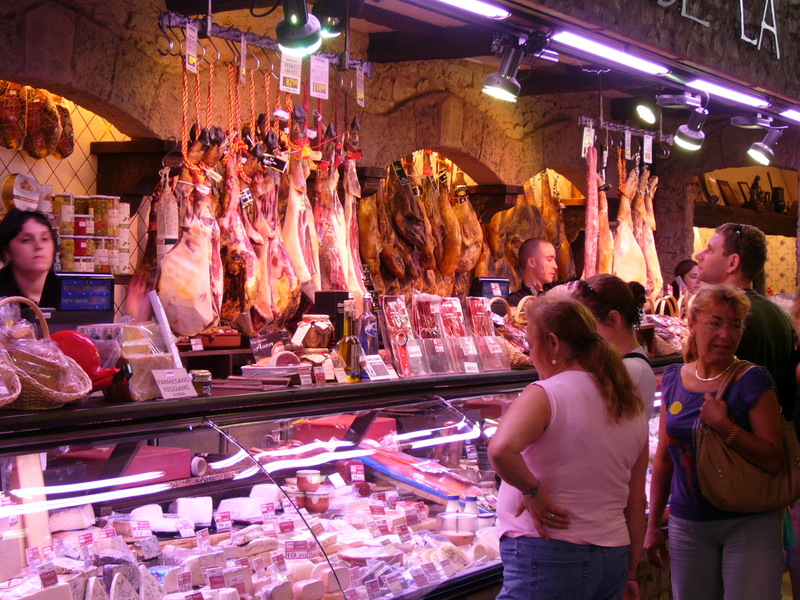 I’ll be reporting soon on my amazing gastronomic adventures in Barcelona and San Sebastian and developing some new recipes based on the cuisines of the Catalan and Basque regions. I’m also working to improve my photos (and will hopefully get a new, more reliable computer soon!) so I can post more regularly. Stay tuned and check back soon for updates!